This e-book is copyrighted by MediaMarx, Inc. Resale and reproduction is any shape or form is prohibited without MediaMarx's permission. All rights reserved. 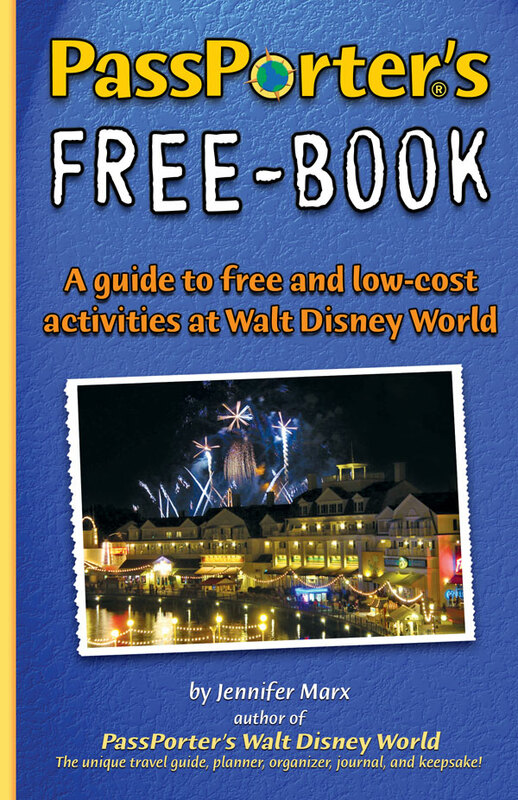 If you already have a copy of PassPorter Walt Disney World, this e-book has LOTS of new stuff. We think of it as the information we would like to include in our printed guidebooks if we had the room. Discover more than 200 free and low-cost activites and items at Walt Disney World and in Orlando and for your Disney vacation! It's hard to believe anything is free at Walt Disney World, but there are actually a number of things you can get or do for little to no cost. This e-book documents over 200 free or cheap tips to do before you go and after you arrive. It's the most comprehensive collection of free and low-cost tips we've seen! You could save a considerable amount of money following these tips. Perhaps more importantly, you can discover overlooked attractions and little-known details most people whiz by on their way to spend money. Each tip has been hand-picked, sorted, categorized, and edited by Jennifer Marx, co-author of the bestselling PassPorter's Walt Disney World guidebook. The tips in PassPorter's Free-Book e-book are gathered from both the authors' extensive experience as well as our fellow vacationers' tips and tricks. And you can rest assured that every tip is up-to-date, accurate, and policy-abiding thanks to the extensive editing by a trusted Disney author. Tips are organized by chapter -- Before You Leave Home, Before the Parks, Downtown Disney, Disney Theme Parks, Disney Resort Hotels, Disney Dining, Off-Property (Orlando), Freedom to Share, and Freedom to Collect. Even if you only use or two tips, you'll be ahead of the game! 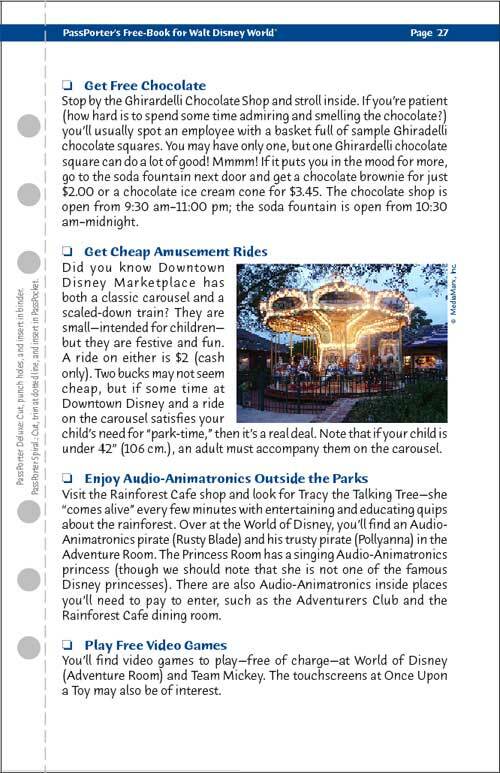 Important Note: This e-book is NOT a general travel guide that covers all the ins and outs of planning a Disney vacation. Instead, this e-book focuses on enhancing the information and tools in our general guidebook, which we assume you will have if you use this file. If you want a general travel guide, try PassPorter's Walt Disney World. Click here to purchase your copy for only $5.95 or get this e-book FREE of extra charges as part of the PassPorter's Club program starting at $4.95 a month with access to ALL our e-books and e-worksheets! "PassPorter's Free-Book" is 96 pages and 3.8 MB. And like all our e-books, this file is fully-formatted just like a regular print book... it will even fit into a Deluxe PassPorter Binder, if you have one. BONUS: Owners of this e-book receive a valuable 30% off discount coupon for any of PassPorter's print guidebooks! The coupon is located inside the e-book (page 91). Buy your copy for only $5.95 or get this e-book FREE of extra charges as part of PassPorter's Club. Terms: Satisfaction is guaranteed! If you are unhappy with this e-book, we will issue a refund. If you are unsure about purchasing this e-book, please be assured that PassPorter is trustworthy. We have been selling our guidebooks online and in bookstores since 1999 -- we have over 500,000 happy readers! Ask about us on Disney message boards!